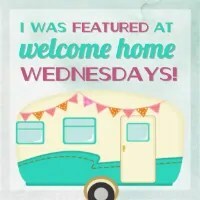 Welcome to Welcome Home Wednesdays #40!!! The computer got put away and I had a fun and relaxing weekend visiting San Diego. Plus, I got to check something off my bucket list – seeing Billy Joel in concert! It was spontaneous since we didn’t have tickets, but he was performing next door to the hotel, so we went for it! Such a talent! Anyway, things have been busy on the blog. We have an awesome $200 Pioneer Woman Merchandise Giveaway! So enter for your chance to win!! It’s time to get started! Each week our little party gets even bigger… and we’re so glad you’re here to party with us! So bring your friends and link up something awesome… we love to see your amazing work around here! Don’t forget to leave us a comment to let us know you stopped by and we’ll do the same when we visit your link! The party will start each Wednesday at 7am CST… and we’ll be here bright eyed, bushy tailed and ready to party! Stop by and share your fabulous posts… we would love to read them and share them with our friends! Like any good hosts we’re sitting right by the present table waiting until our guests leave so we can go through the loot… the loot being your Welcome Home Wednesdays #40 links! We can’t wait to check out what you’ve left for us. Trust me there will be a lot of pinning, tweeting and facebook sharing going on in the near future… we can’t wait to show off what you’ve left! Thanks for coming! It’s nice to be first 🙂 Enjoy your day! Thank you for coming by, Katrin! Have a lovely day! Thanks so much for the party and for featuring our rolling jar storage!Have a great week, Erin! Thank you so much for partying with us! Have a great day! You did a great job! Thanks for partying with us! See you next week! So nice to see you Dee. Thanks for coming by! Enjoy your day! Hi Erin – loved the baseball wreath post and the how she gained 10,000 Pinterest followers post! Very informative! Thanks for hosting! I am so happy to have found this party. Thank you all for hosting! We’re so happy you’re here, Diane! Thanks for joining us! Have a great day! First things first, thanks so much for the feature. I’m sorry to be a day late to the party, but dealing with events beyond my control…you know how that is. So honored to be with such great company at this party and looking forward to next week. PS…I can only imagine how great that concert was. I have always loved Billy Joel, what a great treat. Of course! You make great projects! I know how it goes, life always throws curveballs. We just love having you here…so thanks for stopping by and partying with us.